Marble stone (Average Cost per Slab $800-$2,500) is formed from limestone, superheated to form its unique crystalline structure. Marble countertop surfaces are timeless with their classic beauty and elegance. If you want a surface that will last for years, this natural stone countertop material is perfect for you. The reason marble remains in heavy demand for countertops is its elegant appearance. This igneous stone comes in a wonderful display of color. Your choice of hues includes solid white, solid black and a range of variety colors in the rose, yellow, gray, green, white and black spectrums. No two slabs are alike, so you’ll be assured of having a unique countertop for your home! 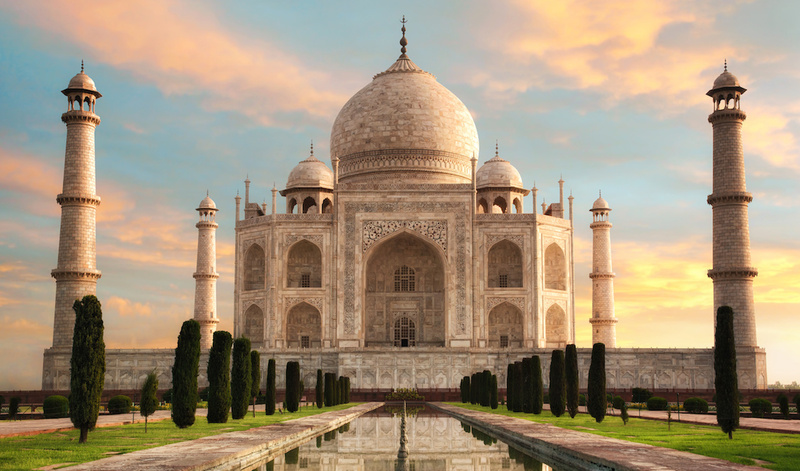 The Taj Mahal in India is made entirely of marble! Granite is a dense material created deep inside the earth’s core. Marble is formed from sediments from under the seabed. Both turn to stone after millions of years but the mineral make up of the stones is different. The stones therefore react differently to various chemicals and cleaners, as well as wear and tear. Granite is better suited for countertops, while marble may be better suited for fireplace enclosures. Should I use marble countertops in my kitchen? While not the most durable stone for application in the kitchen, marble can shine in other areas of your home such as entryways, dining areas, and bathrooms. Marble is vulnerable to staining agents (like wine, juice, and oil) that seep deep into the rock. When this happens, it’s difficult to reverse, so professionally sealing the surface upon installation is essential to help prevent damage. Also, sharp knives can scratch the surface. Is marble a good choice for high traffic areas? Yes, since ancient times marble has been used in all areas of homes from furnishings to floors. Marble has proven as durable as materials traditionally considered to be sturdier with the added benefit of creating a warm welcoming atmosphere. Back in ancient times, you could easily tell where a piece of marble came from by looking at its color. Marble is primarily white but can come in other colors as well. Calcite, dolomite crystals, and aragonite are the key components of marble. Pricing starting at $800 per slab! Marble is a metamorphic rock, which means it has gone through a physical change, or more commonly know metamorphosis. This change happens when heat and pressure that naturally happens inside or on Earth’s surface changes a rock over thousands of years. Marble starts out as limestone rock, which is made of hardened fossils, and then heat and pressure changes it into marble. 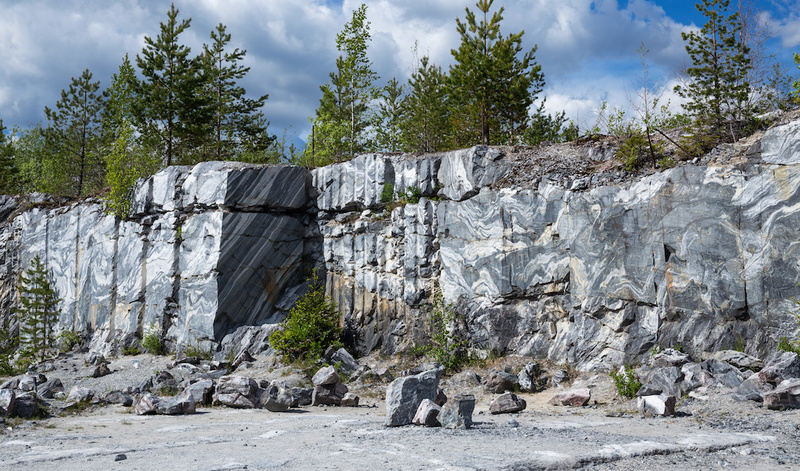 In nature, marble can develop to be very large rocks, up to hundreds of feet in size! Marble is made of tiny minerals called calcite or dolomite. Sometimes, small amounts of other minerals like quartz and mica are found in marble, which gives it various natural colors, patterns, or designs. Marble is found in various places around the world including India, Greece, Spain, Turkey, Italy, and the United States of America. Depending on the limestone and the mineral combination within the marble, most marble rates from three to five on the Mohs hardness scale. This makes it less durable than granite. 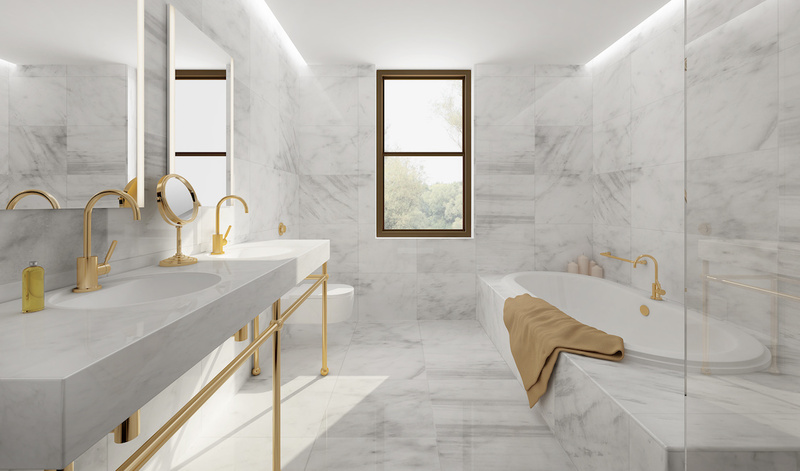 Using marble for your bathroom countertops is a wonderful way to add elegance to your bathroom space. Marble does great in bathroom because it is typically not exposed to the same chemicals and stain agents as it is in the kitchen. The natural beauty of marble makes it a popular choice for decorating, whether in a living room, kitchen or bathroom. Use marble to decorate your fireplace, floor, or wall. There are endless options for adding a bit of flair to your flooring with various marble colors with different veining. Using marble slabs to create stunning marble window sills is a great way to improve the look of any room. Artists and architects use marble window sills to make a statement that will last an eternity. Give your home a timeless and elegant appeal with marble. With many styles to choose from, you’ll appreciate the versatility and uniqueness of marble.